The smartphone market is ruled by giants like Apple, Samsung and Huawei dominating sales worldwide. But that isn’t to say there isn't a place for smaller players, and in the spaces between the established names there's room to shine. Nuu Mobile is one such example of a smaller smartphone manufacturer attempting to make waves, expanding across the world in a fairly short space of time while also keeping a relatively low profile. According to its website, the firm operates in several countries, having been born of a partnership between companies in Hong Kong and the USA in 2010. The brand has recently launched in the UK and to differentiate itself from competitors, it's offering UK-based customer support and a 2-year warranty - but is this enough to merit a purchase? Having mentioned the 'spaces between' and the potential for growth, the story of smaller players in the smartphone game is often depressingly repetitive and brief. We've seen this happen to Kazam, Wileyfox, GeeksPhone, Jolla and more - the potential for failure is real. That said, Nuu Mobile seems to have a relatively robust business model, along with a diverse array of handsets. Looking through what is available however, the most recent 'flagship' - the Nuu G3, - comes running Android 8.0 - a version first released in 2017. Some other Nuu handsets take that version back further, all the way to Android 7.1 Nougat, which in software terms is roughly antediluvian. MediaTek chipsets are also par for the course throughout. Although these are powerful enough in everyday use, they compound the software update problem, as though the chipset manufacturer is popular with manufacturers, it isn’t known for releasing regular up-to-date firmware for Android version upgrades. Added to the fact that these are budget handsets, this essentially means that there may be little chance of continued software support for any device purchased. The devices offered seem to have a strong balance of design and power, however this in itself doesn’t mean a great deal. 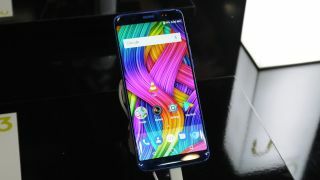 Competition in the budget space is fierce, with the likes of Motorola, Nokia, Xiaomi and Honor often offering premium designs and performance at low prices. The Nuu G3 (£199.99) and the Nuu G2 (£179.99) are being offered at the moment directly from the manufacturer’s website. Both offer 720p or above displays, dual-lens rear cameras, octa-core MediaTek chipsets, 4GB of RAM and 64GB of storage. As things stand however, the pricing isn’t overly competitive, with the likes of the Huawei P Smart (2019) offering greater value than the likes of the G3, with Huawei's phone offering a Full HD+ screen and an almost bezel-free design at the same price. The viability of Nuu’s business in the UK goes further than software updates and pricing though, as there is also the matter of customer service. Although Nuu is offering a competitive service on the surface, the relatively small size of its operation means that getting a fix for its devices beyond the in-house customer support team may be difficult. And should the company pull out of the UK due to adverse trading conditions or otherwise, consumers could be left without any recourse. Should the price be right, should there be an excellent deal, those looking for a standard smartphone experience and are happy to go out on a limb may be well served by Nuu Mobile. From what it seems, the company has built a relatively loyal following on other shores. However, for the average buyer, we would recommend holding off on making a purchase at this point, leaving time for Nuu’s business to expand and for the company to prove itself in the UK market.